It’s like a paddlewheeler but for your truck. This video turned up on our internet thanks to Chinese carmaker Geely’s PR person Ash Sutcliffe, who posted this video today. 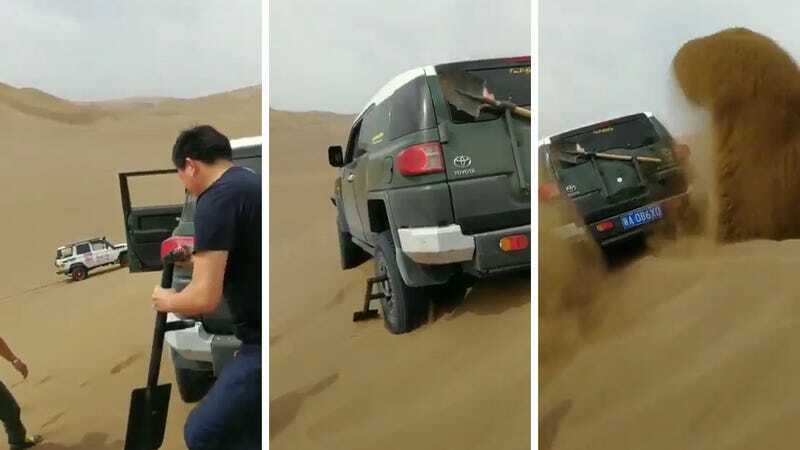 We see a Toyota FJ Cruiser stuck on a sand dune unable to drive out as normal, big tires, all-wheel drive and all. Other offroaders might at this point dig out the sand under their tires, go into the back of their trucks, pull out some ladder-like looking devices, then slot the ladders under the tires and use them for traction to drive away. I’ve done that. It’s not horrible, but if you don’t want to break a sweat while running in the desert, this paddlewheel attachment system certain seems a bit easier on the back.